Breathtaking Views! Hot Tub on Deck! Meticulously Cared For! Great Location! Eagle's Nest is the perfect romantic get-away for couples, a great place to enjoy close friends, or a wonderful family bonding place. Located slightly over an hour from north Atlanta, life slows down. We like to say "so close, yet so far away!" While you are only minutes away from Blue Ridge and Ellijay, GA... just drive a few miles and you will discover a whole new world. And yes, the roads leading to the cabin are safe and any car can easily access our wonderful property. Just minutes away guests are able to enjoy everything from moseying among the eclectic shops and great restaurants in Blue Ridge and Ellijay to high adventure on the Ocoee River. As you enter the cabin you will immediately appreciate the cleanliness and broad set of well appointed amenities. Relax on the porch or deck with a drink, good book, or with friends overlooking the Blue Ridge mountains. Enjoy the hot tub and breathe the clean air as you gaze at the eloquence of Mt. Rich, one of the highest peaks in Georgia. Step into the back yard and enjoy smores roasted over the fire pit. Less than a quarter of a mile away from the cabin is the entrance to beautiful Benton Mackaye Trail. When you finally pull yourself inside to relax or for a good nights sleep, your choices are a king bed in the master, a queen bed in the guest room, or a day bed with a trundle in the loft. But don't miss enjoying the flat screen TV with cable TV to enjoy sports, your favorite TV show, or catch up on the news or a fun game of foosball, board games or darts in the loft. In addition there is a flat screen TV in the loft as well as a wonderful comfortable chair to settle in and read. Wifi is provided. Each of the cabins that we own and manage (three) sit adjacent to one another in Cherry Log, GA, just fifteen minutes south of Blue Ridge, GA. These investments were made to provide our guests with the best experience possible as they enjoy the beauty of the North GA Mountains and the surrounding area. At our cabins, you can always expect a spectacular view, wonderful location, extreme attention to cleanliness, privacy, very competitive pricing, beautiful cabin decor, attention to detail for your comfort, and always personal and helpful service. Keywords: Breathtaking Mountain Views with hot tub. Great Deal! Wifi. Ask about discounts... Special Seasonal Discounts, AAA, Fireman, Police, Minister, Teacher, Honeymoon, Anniversary, Birthday and Seniors. Deck, fire pit, screened in porch, hiking trails, nearby stream, wildlife, 15 minutes to Blue Ridge with quaint downtown shopping and restaurants/ 25 minutes to Aska Rd. wilderness experiences/ 40 minutes to Ocoee Whitewater. Matt and Vickie Brinkley reside in Alpharetta, GA where they have lived for 25 years. Matt is a minister and Vickie a retired teacher. They are thankful to provide their cabin in hopes that all will find a wonderful place of rest and fun. After years of renting a cabin in North Georgia, we decided that we would scope out the very best place to truly sense a get-away but close enough to allow for regular visits. 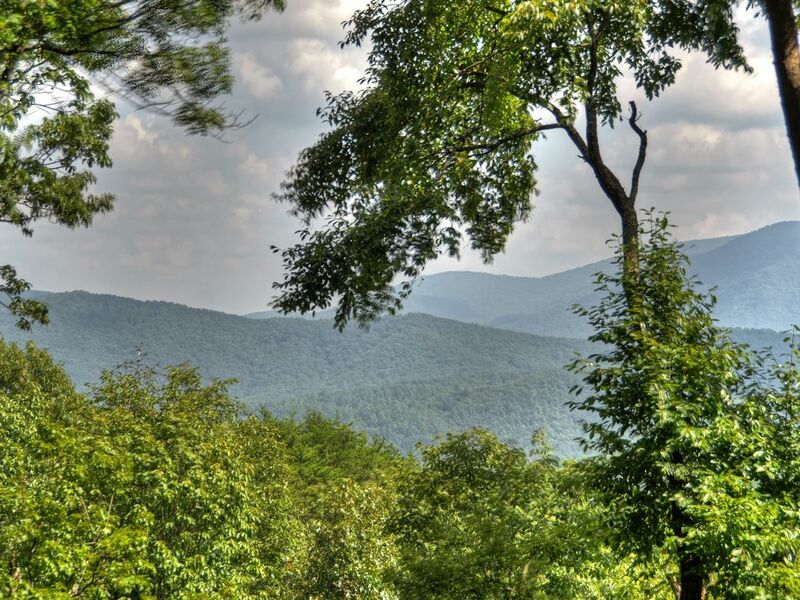 The beautiful area of Cherry Log/ Blue Ridge stole our heart. You will not find a cabin that is this well kept... with incredible views... at this price! Check out the reviews. Wonderful mountain views looking directly at 4,000+ ft peaks. Outdoor hot tub for 4 on deck overlooking mountains. Great hiking and fishing directly in the area. The Benton McKay trail literally runs through our community. Reservations must be made at least six weeks in advance for 2 and 3 payment agreements. Reservations made within six weeks of rental require full payment.